The International Olympic Committee (IOC) said on Sunday the Japanese capital city of Tokyo has been picked as the host city of the 2020 Olympic Games. The IOC disclosed this is in a statement released in the Argentine city of Buenos Aires, saying Tokyo was chosen ahead of Istanbul and Madrid after two rounds of voting. The voting was conducted during the 125th IOC Session in Buenos Aires on Sept. 7. 'Tokyo received 60 votes to Istanbul's 36 in the final round, with Madrid having been eliminated in the first round after losing a tie-breaker with Istanbul,' the statement said. 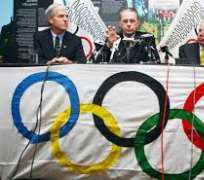 It quoted IOC President Jacques Rogge, whose 12-year term in office comes to an end on Sept. 10, as saying Tokyo presented a very strong technical bid from the beginning. 'Congratulations to the city of Tokyo on its election as host of the 2020 Olympic Games. 'Tokyo presented a very strong technical bid from the outset, and it needed to compete with two such high-calibre bids from Istanbul and Madrid. 'All three cities are capable of staging excellent Games in 2020, but in the end it was Tokyo's bid that resonated the most with the IOC membership. 'This invites us to `discover tomorrow' by delivering a well-organised and safe Games that will reinforce the Olympic values while demonstrating the benefits of sports to a new generation,'' Rogge said.